So here it is! My inspiration, my muse, my motivation to bake bread that has no salt in it. 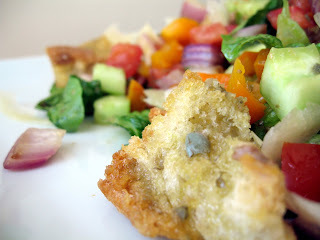 Panzanella, or "bread salad," is a down-home Tuscan dish of humble origins that had me enchanted from the first bite. Originally an inventive way to use up leftover bread (and any vegetables you might have lying around), this dish is so delicious you'll want to bake a loaf of pane toscano especially for it! I could barely wait for the bread to cool from the oven before I started tearing into it to make the panzanella. 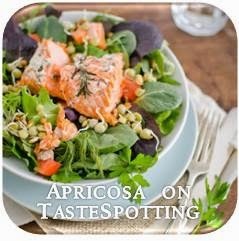 My version here is a beautiful profusion colors, flavors, and textures--with crisp vegetables, caramelized onions and peppers, fresh basil, and shavings of Parmigiano-Reggiano--and stars hunks of pane toscano soaked in the most luscious dressing ever. I first had panzanella while visiting Florence, and it made such an impression on me that I have longed ever since to recreate and enjoy those flavors once again. It was at the Mercato Centrale, a vast warehouse-like structure of farmers' stands, deli counters, confectioners' shops that has been in use since 1874. On that day, the dimly-lit, cool, cavernous space was a welcome relief from the hot, glaring summer sun, and we gratefully took the opportunity to rest our weary feet over a late lunch there. Though we had arrived at the end of the lunch hour, we were lucky enough to still get a couple of dishes at the food counter. 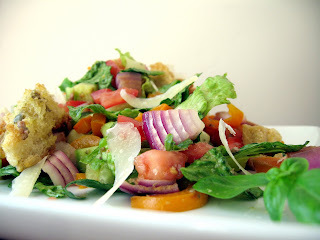 One was an intensely-flavored savory stew, and the other was panzanella, the traditional Tuscan "bread salad." 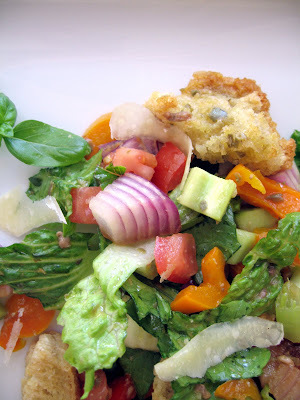 For the life of me, I cannot remember the exact ingredients that first panzanella contained, but I believe I have finally hit upon a recipe that evokes nearly the same level of supreme enjoyment that I experienced years ago. I think the secret is the dressing (which I found at the King Arthur Flour website, of all places); the pieces of saltless pane toscano soaked in olive oil, red wine vinegar, and mashed garlic, capers, and anchovies will make you groan with delight, will make you jump up and down, will make you run back to the serving bowl for more. Just saying, from personal experience, you know! Finely mince garlic clove, capers, and anchovies (a garlic press works well for both the garlic and the capers) essentially to a paste, and whisk all dressing ingredients together. Set dressing aside to let the flavors meld. Heat 1 Tbs. olive oil in a large skillet over medium-high heat, tilting pan to coat cooking surface evenly with oil. Carefully place the onion slices onto the skillet, keeping rings intact, and cook, turning once, until slightly softened and beginning to caramelize on each side. Remove slices to a plate and cool completely, then dice, keeping layers together as possible. Add bell pepper and minced garlic clove to skillet and saute until pepper is slightly softened and beginning to caramelize. Remove sauteed peppers and let cool completely. In a large bowl, mix together the onion, bell pepper, cucumber, tomatoes, lettuce, basil, half of the Parmigiano, and cubed bread. Drizzle dressing over and toss to combine, seasoning with salt and pepper to taste. Let sit 15-30 minutes. 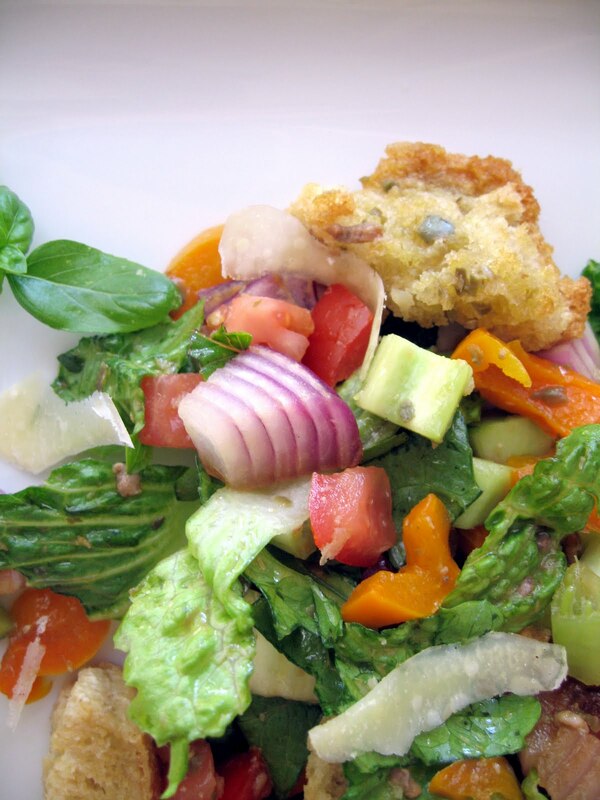 Garnish salad with remaining curls of Parmigiano and serve. 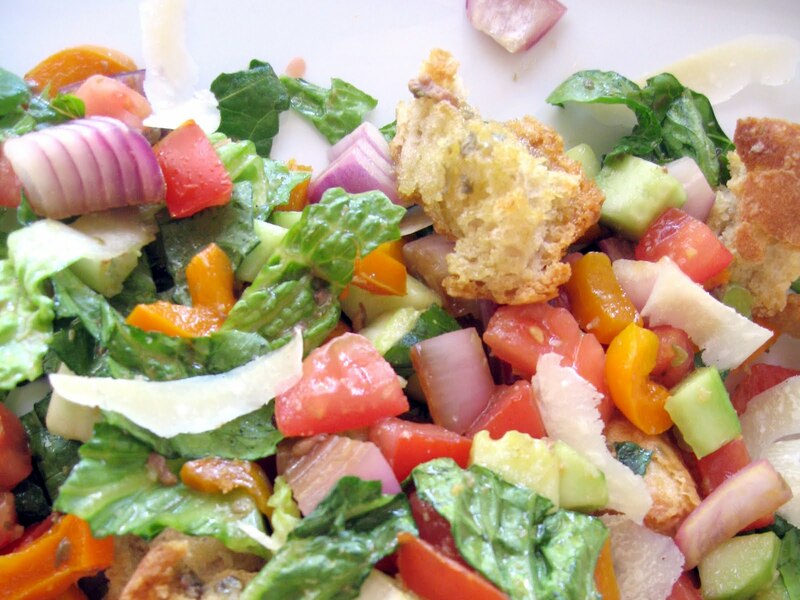 Bread salad sounds super delicious! What an inspiring post. Erica, how do you take such great food photos?! What's your technique? Everything you make looks amazing & delicious! Lots of fun in the world of foodography! I just wish I could have a DSLR camera and graduate on to the next level!